Voter fraud myths range from half truths to outright fallacies, we explore persistent voter fraud myths on all voter fraud types from individual to group. First off let us start by pointing out that voter fraud as a general concept is real, individual voter fraud does happen, and furthermore voter fraud happens on a number of different levels and in a number of different ways. The myths about voter fraud tend to lie more with exaggerations of the prevalence of voter fraud types rather than claims to their existence. Let us also point out that voter fraud doesn’t have to be illegal, it simply has to be the tampering of the electoral process. So we can consider both someone voting twice as voter fraud (illegal) and we can see a voter ID law (legal) as voter fraud. Below we will break down some common voter fraud myths to help shed light on the truth behind voter fraud in the United States. Myth: Voter Fraud is one thing. More of a misconception than a myth, there are actually a wide range of different types of voter fraud. Types of voter fraud include voter fraud on the part of individuals, small groups, large groups, politicians, citizens, private companies, and more. Voter fraud includes, but is not limited to: • absentee ballot fraud, • voter registration fraud, • voter intimidation and suppression, • deceased voters on voter registration list and/or voting, • multiple voting, • felons voting, • non-citizens voting, • vote buying, • deceptive practices, and • fraud by election officials. 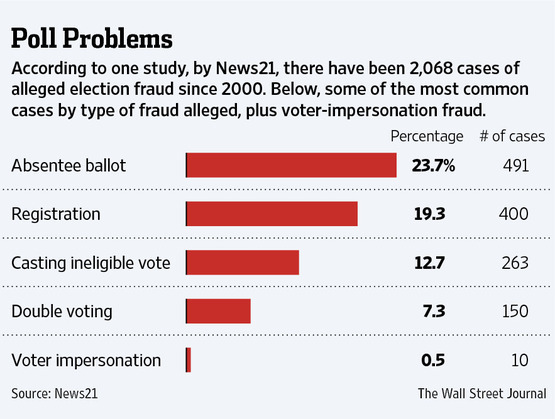 Myth: In-person Individual voter fraud is a problem. Depending upon your definition of a problem you may consider this a myth or not. 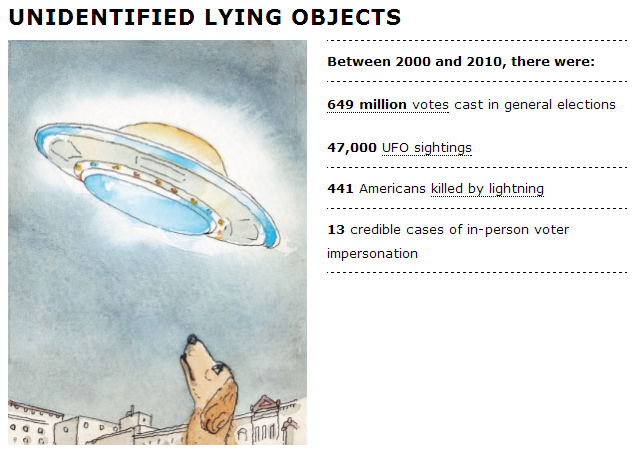 In-person individual voter fraud is rare with convictions for in-person voter fraud being less common than UFO sightings. That being said there would obviously be more suspected cases of voter fraud than convictions, and we can’t rule out the effect this could have in specific elections. Consider in the 2000 Florida elections George Bush won by 537 votes during a recount and became president. Myth: It’s called “Jerrymandering” and it’s not a problem. To contrast the point above, Gerrymandering (pronounced with a “G” and not a “J” and named after Governor Elbridge Gerry (pronounced /ˈɡɛri/; 1744–1814) could actually be considered a problem. There have been many accusations gerrymandering (redrawing district lines for political advantage). The reason this is a problem is because in these situations a lot of power can be put in one person’s hands. For instance the incumbent can redistrict to push a contender out of their district or to ensure that those favorable to their party will dominate the district. Since one person’s actions can affect a wide number of people, and since redistricting is legal this can pose some big problems. Myth: Electronic voting is smart / dangerous. Supporters and opponents of electronic voting tend to have strong feelings. One side thinks it can help eliminate voter fraud and the other thinks it simply facilitate voter fraud. The truth is both sides have merit. On one hand electronic voting and voter registration would help make the process of voting easier and more widespread, also (when done correctly) ensures that everyone casts one vote. However, an electronic system that is insecure in anyway could lead to manipulation of votes by a group (think the Diebold shenanigans). While electronic voting is certainly the future of voting, the road we take to get there could be a bumpy one. Both sides of the voter ID debate have merit. On one hand the average person believes in “one citizen, one vote”, but on the other hand basic logic will tell you that restrictive voting laws are going to decrease the number of the 55%(ish) of Americans who vote. We should be finding ways to ensure more people participate in a fair election, restrictive voter ID laws that make it impossible for students to vote are an example of an imperfect solution at best. Myth: Hundreds of thousands of Illegal aliens vote in elections. There is actually no way to know how many illegal aliens vote, or what elections they vote in, or to what extent these people are participating in society. The problem stems from the fact that the US still lacks a clear, organized, and accurate way to facilitate voting and vote counting. Studies have shown that illegal aliens voting has been an issue and other studies have shown the opposite. For instance in Florida going into the 2012 elections the GOP attempted to purge “illegals” from the voting roles. However, it turned out that nearly 90% of those they were trying to purge were legal minorities. Keep checking back for more voter fraud myths. As this site grows we will continue to compile an ongoing list of misconceptions, myths, and half-truths on voting. Below are number of resources that will help you learn more about the facts and myths of voter fraud in America. We suggest checking out the U.S. Election Assistance Commission and the Brennan Center for Justice. Also, wikipedia has a pretty solid breakdown on the subject which spans multiple pages. Or try the Heritage Foundation for the Libertarian view. Below are resources originally presented by the Washingtonpost. Caught in the Act: Recent Federal Election Fraud Cases, by Delia Bailey of the Washington University in St. Louis. Bailey unearthed only nine federal election fraud cases occurring between 2000 and 2005. Identifying Election Fraud Using Orphan and Low Propensity Voters, by Ray Christensen and Thomas Schulz of Brigham Young University. The authors devise a new test for identifying instances of voter fraud; turn up no new instances of voter fraud. A two-year investigation by Iowa’s Republican secretary of state found evidence of 117 possible fraudulent votes and led to just six – six! – criminal convictions. In 2011 a Wisconsin task force found sufficient evidence to charge 20 people with fraudulent voting in the 2008 elections. Most of these were felons who were ineligible to vote. Kansas’ secretary of state examined 84 million votes cast in 22 states to look for duplicate registrants. In the end 14 cases were referred for prosecution, representing 0.00000017 percent of the votes cast. A 10-year ‘death audit‘ in North Carolina turned up a grand total of 50 instances in which a vote may have been attributed to a deceased person, most likely due to errors made by precinct workers. Voter fraud isn’t limited to one type of voter fraud or even common types of voter fraud. It is simply illegal tampering with the process of an election. The reason (at least on paper) that voter fraud laws are in place is to protect democracy from corruption and to ensure that all who are eligible vote can do so and all voters have an equal vote in any given election. Electorate Manipulation- Manipulation of Demography and Disenfranchisement. Intimidation- Violence or the Threat of Violence, Attacks on Polling Places, Legal Threats, and Economic Threats. Vote Buying- Rewarding a voter for voting (or not voting) in a specific way. Misinformation- Presenting false information about the process of voting or the issues of an election. Misleading or Confusing Ballot Papers- Presenting confusing or misleading ballot papers. Like vote “yes” to vote “no” on “not not legalizing marriage equality”. Ballot Stuffing- The submission of multiple votes by one person. Misrecording of Votes- The process of incorrectly counting votes or attributing a vote incorrectly. Misuse of Proxy Votes- Tampering or misrepresentation in the process of proxy voting. Destruction or Invalidation of Ballots- The process of destroying or hiding ballots. Tampering with Electronic Voting Machine- Just as it sounds, the process of tampering with an electronic voting machine in anyway before or after the voting process. Gerrymandering– The act of redistricting for political advantage. Voter Suppression– Suppressing eligible voters by any legal or illegal means in local, state, or federal elections. What Types of Voter Fraud are a Problem in the US? Any type of voter fraud is serious and there is no type of voter fraud that is harmless. That being said many types of electoral fraud have little to no effect on our democracy and our elections. Other types of voter fraud could potentially unhinge the very fabric of our democracy. To understand some of the most pertinent types of voter fraud be sure to check out each section of our site. 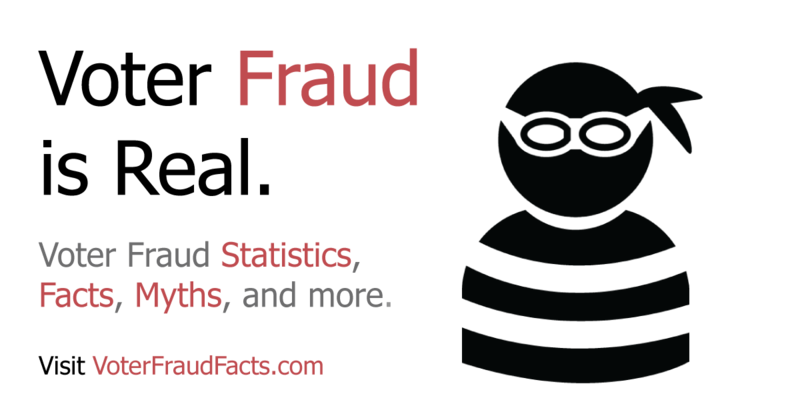 We provide a detailed look at the history of different types of fraud with facts and statistics on reported cases. Educate your self about the types of voter fraud so you can help to fight against them to protect your vote in the next election. The statistics on voter and election fraud indicate that, while rare, it is real. In-person voter fraud is the rarest form of election fraud. Recently, voter fraud has been a hot-button topic in the US. Much of this stems from the staunch supporters and opponents to the wave of voter ID laws which have been sweeping across the country. Supporters argue that voter fraud is rampant and that these laws will address the problem. Opponents call voter fraud a myth and say the voter ID laws will disenfranchise millions of otherwise eligible voters. Understanding the statistics of voter and election fraud provides insight into the types of voter fraud that occur and their prevalence, as well as, shapes a more rational discussion about how to protect the sanctity of US elections. There have been many studies looking at the specifics of election fraud over the years. These studies examine the types of election fraud, the amount of accusations vs prosecutions vs convictions. The statistics provided by these studies are not completely consistent, but the methodologies used to conduct them varied as did the break-down of voter fraud types reported. Some looked only at certain states, while others focused on national wide court documentation. The important thing to consider when comparing studies of this nature is: where they are consistent and how closely the statistics hold true at present. In-person (AKA Impersonation) voter fraud is the most rare form of voter fraud and it is the only one that the Voter ID laws would have any impact on. It involves a person physically going and voting for someone else, like a family member or someone who is deceased. This type of voter fraud is also the least likely to threaten our election process. It is simply unrealistic to think any attempt to throw an election could be accomplished by individuals physically going and waiting in lines at different polling stations to vote as multiple people. Between 2002 and 2005 nine people were accused of voted twice in the same election according to the U.S. Department of Justice, Criminal Division, Public Integrity Section. Of those 9 cases, 3 of the cases were dismissed, 1 was acquitted, and 5 plead guilty. News21 conducted a study of 2,608 cases alleging voter fraud nationally from 2000 to 2012 and found only 1 case of in-person voter fraud every 207 cases involving other types of election fraud. Of those 2,608 cases alleging voter fraud, only 77 were alleged fraud by voters and of those only 33 could be verified as convicted or plead guilty. Absentee ballot fraud comes in 2 forms: intentionally using an absentee ballots in more than one election (requires a person to have also committed voter registration fraud) and intentionally voting for someone else using their absentee ballot card. There are also cases where campaign workers illegally misinformed voters and collected absentee ballots not intending to turn in those with votes for the opponents. News21 conducted a study of 2,608 cases alleging voter fraud nationally from 2000 to 2012 and found 491 cases of absentee ballot fraud. Voter registration fraud is a hard topic to tackle. Much of suspected voter registration fraud is based on the high numbers of individuals who are registered in more that one place. According to the Pew Center on the States, 2.75 million Americans are registered to vote in more than one state. However, this is not an accurate indicator of registration fraud. A person who moves to a new state and registers to vote without deactivating his registration in his previous residence should not be assumed to have criminal intentions. Another example generalization of voter fraud is the assumption that the millions of deceased persons who have not been removed from the registered voter lists. Again, while it does leave the door open for fraud, it is not by its self indicative of fraud. The Pew Center on the States estimates 1.8 million deceased individuals remain listed as voters. There is also intentional and unintentional voting by persons who are not eligible to vote. While it is also considered in-person voter fraud, it is done by persons who have been registered to vote and presumably has some form of ID, so it is unclear whether Voter ID laws would have an affect on this type of fraud. Between 2002 and 2005 twenty-nine people were accused of falsely claiming voter eligibility to the U.S. Department of Justice, Criminal Division, Public Integrity Section. Of those 29 cases, 10 were accused of being felons in states where felons lose their voting eligibility and only 5 of those plead guilty or were convicted. The other 19 were accused of not being citizens and 14 of those either plead guilty or were convicted. The Milwaukee Journal Sentinel conducted a study in Milwaukee and found that 361 felons still under state supervision had voted out of 203,000 total votes cast. When questioned these individuals claimed they did not know they were ineligible to vote. Felons can legally vote in Wisconsin, but only after they have completed their probation or parole. News21 conducted a study of 2,608 cases alleging voter fraud nationally from 2000 to 2012 and found 74 cases alleging felons voting and 56 cases alleging non-citizens voting. They also found 400 cases alleging registration fraud, but doesn’t provide the details as to convictions or guilty pleas. Election Official Fraud is typically done by ballot stuffing, but it also could include voter intimidation or preventing voters from casting their vote. The New York Times researched studies over five years and found 3 cases of voter fraud by election officials. Typically this is done by either buying votes or misleading voters about the actual election details. Between 2002 and 2005 30 people either plead guilty yo or were convicted of buying votes. More than 30 were linked to small vote-buying schemes in which candidates generally in sheriff’s or judge’s races paid voters for their support. The New York Times researched studies over five years and found 31 convictions of campaign workers for voter fraud and 10 convictions of Government officials. Believe it or not voter fraud rarely happens at an individual level. Although you may hear about the rampant problem of voter fraud in the United States. Take this statistic, in Ohio in 2004 the percentage of individuals accused of voter fraud was 0.00004% (about the amount of times Americans are struck by lightening every year). So if individual voter fraud isn’t a problem in the US, then why is the issue so focused on? The simple answer is that the groups that focus on individual voter fraud are trying to distract the American people or fire them up. If fingers are being pointed left and right and voter fraud is a big confusing issue it is that much easier for groups to commit voter fraud. Out of the 197 million votes cast for federal candidates between 2002 and 2005, only 40 voters were indicted for voter fraud. Only 26 of those cases, or about .00000013 percent of the votes cast, resulted in convictions or guilty pleas. Multiple studies (including some detailed here) have found that almost all cases of in-person impersonation voter “fraud” are the result of a voter making an honest mistake, and that even these mistakes are extremely infrequent. Special interest groups have a long history of voter fraud in the US. You see while individuals have almost nothing to gain from defrauding the government and risking their freedom for one vote, groups have a much bigger incentive. So what is the incentive for groups to point voter fraud accusations, winning elections. That’s right, if you control the vote, you control the elections and this simple fact has been the root cause of corruption in both the US voting system and the voting systems all over the world. The bottom line on Voter Fraud in the US: Individual voter fraud is nearly nonexistent, while voter suppression and voter fraud by powerful political groups as been in ongoing issue throughout history. In Missouri in 2000, for example, the Secretary of State claimed that 79 voters were registered with addresses at vacant lots, but subsequent investigation revealed that the lots in question actually housed valid and legitimate residences. 2004 election in Ohio revealed a voter fraud rate of 0.00004%. A 1995 investigation into votes allegedly cast in Baltimore by deceased voters and those with disenfranchising felony convictions revealed that the voters in question were both alive and felony-free. Many of the inaccurate claims result from lists of voters compared to other lists – of deceased individuals, persons with felony convictions, voters in other states, etc. In Florida in 2000, a list of purged voters later became notorious when it was discovered that the “matching” process captured eligible voters with names similar to – but decidedly different from – the names of persons with felony convictions, sometimes in other states entirely. A 2005 attempt to identify supposed double voters in New Jersey mistakenly accused people with similar names but whose middle names or suffixes were clearly different, such as “J.T. Kearns, Jr.” and “J.T. Kearns, Sr.,” of being the same person. Even when names and birth dates match across lists, that does not mean there was voter fraud. it is more likely than not that among just 23 individuals, two will share a birthday. Similar statistics show that for most reasonably common names, it is extremely likely that at least two people with the same name in a state will share the same date of birth. Other allegations of fraudulent voting often turn out to be the result of common clerical errors, incomplete information, or faulty assumptions. Most allegations of voter fraud simply evaporate when more rigorous analysis is conducted. This is just a small selection of important voter fraud statistics in the US. Regardless of your opinions the facts show that the republican party has been using voter fraud as a political weapon to disenfranchise those who are likely to vote for the Democratic party, to get rid of votes for the opposition and to actually commit voter fraud themselves. It’s time for it to end. Stand up for the laws that make our country great and help to change the voter fraud statistics. We take an unbiased look at voter fraud facts and statistics to uncover the truth behind voter fraud and voting laws in the United States. Individual in-person voter fraud is shown to be rare by many studies, while other types of voter fraud have been more common throughout US history. Some see voter ID laws, which aim to protect against in-person voter fraud, as a modern day poll tax and as a form of voter fraud called “voter suppression“. Voter fraud doesn’t have to be illegal to be considered voter fraud. Voter fraud is anything that tampers with a fair voting process. Is Voter Fraud an Issue in the US? Looking for more sources on voter fraud? We suggest checking out the U.S. Election Assistance Commission , Department of Justice, the Heritage Foundation, and the Brennan Center for Justice. Accusations of voter fraud come from both sides of the isle, but both the “left” and “right” in America seem to have very different and conflicting viewpoints on how voter fraud is occurring. In some cases the facts and statistics back up one group more than the other, but the truth is rarely black or white. Historically both Libertarian and Republican backed organizations have been accused of helping to spread talking points and draft legislation to prevent low-incomes families, students, seniors, and “minorities” from voting. On the other hand, Liberal and Democrat backed groups insist that individual voter fraud is a myth. Meanwhile groups like the organization ACORN have been accused of facilitating individual voter fraud. While the above truisms may overshadow the voter fraud debate, it doesn’t excuse or explain away the history of voter fraud in America. This site recognizes truisms, but the intention isn’t to demonize a political party or to push a political agenda. We simply aim to uncover and present the facts on voting, one of the most important aspects of our Democracy. At Voter Fraud Facts we take an in depth look at voter id laws, voter fraud myths and other voter suppression tactics meant to prevent voter turnout. Between 2000 and 2010 there were 649 million votes cast in general elections and 13 cases of in-person voter impersonation convictions. Here in 2015 one of the main sources of voter fraud controversy are Voter ID laws. Some label these as the modern day poll tax, others say they protect our democracy against individual voter fraud. Voter ID laws require a valid form of ID to vote. Voter ID laws can be strict or non-strict. The more strict the law, the more obstacles there are to obtaining the proper ID. At the turn of the 20th century the south enforced a poll tax to prevent poor people, specifically black people from voter registration and voting. 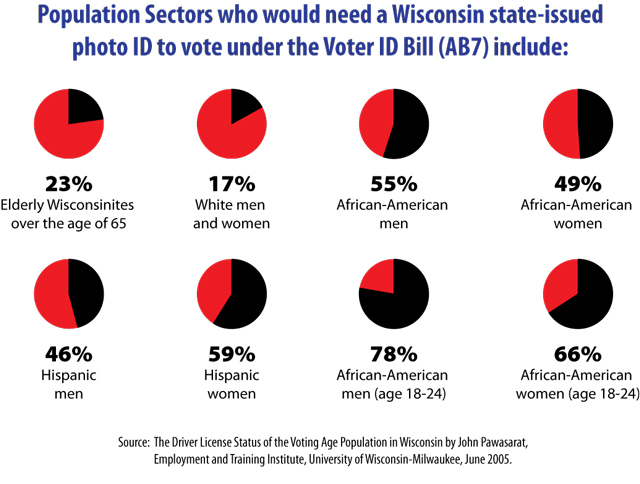 Voter ID laws are seen by some as a modern form of poll tax because many of the country’s poorest will not be able to vote due to a lack of proper state issued ID. Anywhere from 6% – 11% of voting-age US citizens don’t have a valid form of state ID. Roughly 2% are registered voters. In order to obtain a “free ID” they need a certified copy of a birth certificate which costs from $10 to $45 depending on the state, a passport which costs $85, and certified naturalization papers which cost $19.95. As an added catch-22 obtaining a certified copy of your birth certificate usually requires a government-issued ID. The “free IDs” could cost tax payers millions. We examine the facts like the ones above in detail on our Voter ID facts page. What is Voter Fraud / Electoral Fraud? Voter Fraud (often called electoral fraud or vote rigging) is the act of illegally tampering with an election. Although the major issue being discussed by talking heads is voter ID fraud, there are a number of different types of voter fraud. Make sure you know exactly what voter fraud statistics are being discussed when you read an article or listen to a talking heads. The severity of the fraud problem can be greatly blown out of proportion by quoting other voter fraud stats instead of voter ID statistics specifically when debating the validity of voter ID laws. Types of voter fraud include intimidation, vote buying, misinformation, misleading / confusing ballot papers, ballot stuffing, incorrect recording of votes, misuses of proxy votes, destruction / invalidation of ballots, and tampering with electronic voting machines. Learn more about the different types of Voter Fraud. Voter Fraud… Does it exist or not? With all the talk from Republicans about how big of a problem voter fraud is for the country and all the talk from the left saying it isn’t an issue, the facts tend to get lost in the confusion. The truth is that voter fraud does exist. Not just in America, but in just about every election since the beginning of time (to be fair, this is a logical assumption and not a fact). Make no mistake, neither the left or right (radicals excluded) think we don’t need to protect our democracy from voter fraud, they just have very different opinions on how this should be done. What are the Politicians Doing to Prevent Voter Fraud? America already has many forms of voter fraud prevention. These include secret ballots, transparency, statistical indicators, prosecution and voting machine integrity. Voter ID laws are a form of protection enacted to prevent in-person voter fraud. Now that you have the breakdown on voter fraud facts and voter fraud statistics, it’s time to find out the real truth on Voter Fraud and Electoral Fraud. Check out the fraud laws, facts and statistics, and get educated for upcoming elections.